You can also view a complete roundup of my maternity looks here from my instagram. In order to shop the looks, just sign up at http://liketoknow.it with your email! 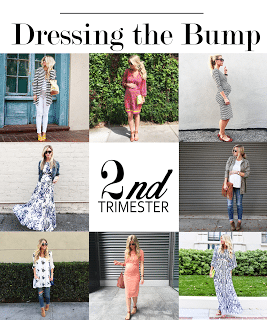 It’s my last installment of my Dressing The Bump series today- the third trimester! If you haven’t seen the previous posts for the first and second trimester make sure to check them out! I have to say, I had a lot of fun dressing my baby bump this time around. It was definitely a challenge at times! And the third trimester was the most challenging for me. I just got to this point in the pregnancy where my tummy was big and not many things were very flattering. But I did a little experimenting (which basically means I wore every kind of clothing that would fit my bump) and narrowed them all down to my very favorites items to wear during the third trimester.Dressing during your third trimester can get tricky, because there are so many pieces of clothing that just make you look ‘big’. And while it can be fun having a cute bump for an accessory, you don’t ever want to look bigger than you actually are, especially in your third trimester. Loose tops can start to get really tricky this far along into your pregnancy. Its one of the clothing items that can definitely make you look bigger than you are if they aren’t the right kind of top. 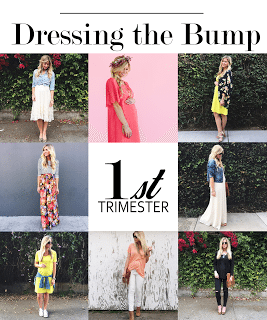 In the third trimester I shied away button up shirts, and oversized tees that were so great to wear in the first trimester. But there were certain kinds of long loose tops that worked with a bigger bump. Look for tops that are long and more narrow (wider tops end up looking extra boxy), and go with fabric that has a nice drape like a silk, poly blend, or chiffon. This top was my absolute favorite for these kinds of tops in the third trimester (I wore it in this post and this instagram). And it is an amazing top for after the baby too! Normal maxi dresses got a little hard for me to wear in the third trimester. That side view of my bump and my booty just wasn’t my favorite. You can always tie a button-up around your waist under your tummy, or throw on a chambray top over a maxi dress to cover some of the curves. While this is a good alternative, I really fell in love with kimono dresses like this one in the third trimester. They fit tighter at the top, and loosen up at the bump, and are really flattering. By the third trimester, even my favorite maternity jeans in the whole world weren’t always quite as comfortable as I wanted. This is mostly due to the fact that it was in the middle of summer and about a thousand degrees outside. I started wearing thin track pants more often and they helped me through the last few pregnant months. I especially love these non-maternity pants from this post, and these black ones from this post. Side ruching is your best friend in your third trimester! Ruching just means that the sides are stitched up with elastic, and it bunches up across your tummy, making room for your bump and flattering your bump as well. Oversized tees do not work at this point! You need something a little more fitted around the bump so you don’t look like a tent. I have this top (on sale now!) in a handful of colors and just rotated through them for the last few weeks (I sized up and got a medium and it lasted my whole pregnancy). I would also highly recommend this top. It’s more expensive than the one I just linked to, but it is fantastic quality and thick enough that it doesn’t require a tank top underneath. The black and white stripe that I wore in this post is super versatile and I wore it at least once a week my whole pregnancy. Knit pencil skirts are easy to pull on and much more comfortable than jeans. Pair them with a fitten ruched top, or if you have an oversized top, make it work by knotting it at the bottom like I did here. I especially love this one and this one. I linked to all of these in my Dressing the Bump post for the second trimester, but I’m linking again because good undergarments are crucial to having a stylish pregnancy! You need a really good long tank for layering over your bump, a comfortable bra to sleep in (because at this point in your pregnancy, your hoots are huge and they need a little support even during sleep), a great fitting supportive bra, and these Spanx that will SAVE YOUR LIFE! They smooth out any bumps ad firm up that booty. 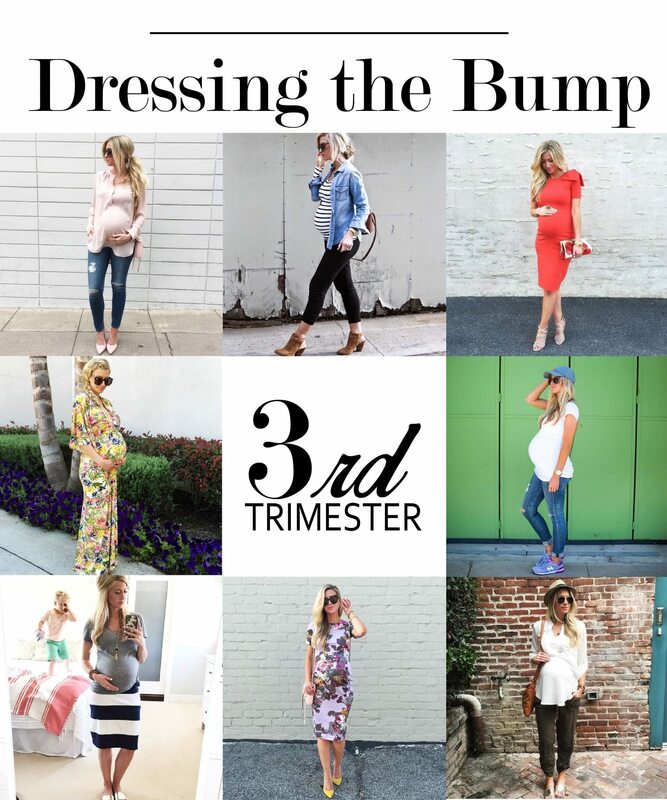 And that completes my Dressing the Bump series! View the First Trimester and Second Trimester posts below. Also, see all of my maternity looks from my #leannesbabybump from Instagram right here!